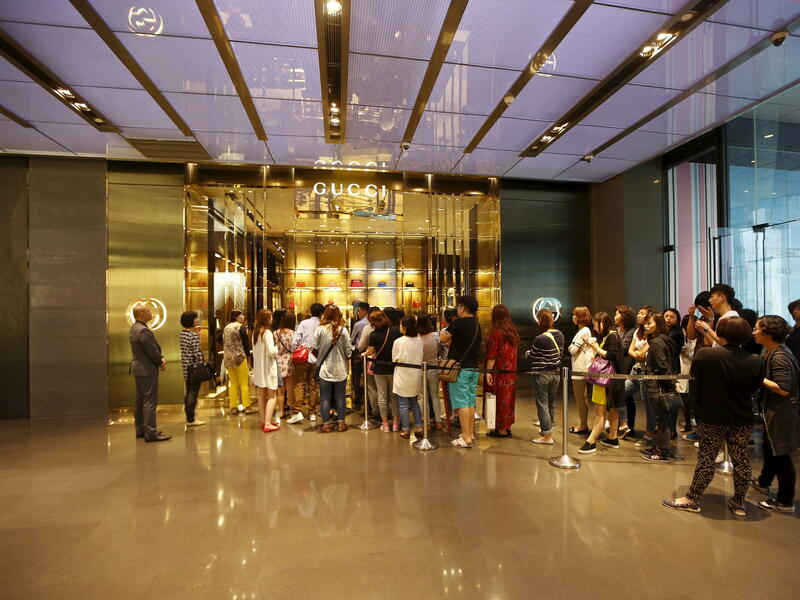 Customers line up to enter the Gucci shop at a mall in Shanghai. After a huge drop in the past couple of weeks, Shanghai stocks rose Friday for the second day in a row. For many, that's a relief. But China's economy has a long way to go. In fact, it's in the midst of wrenching transition from an economy based on investment and manufacturing to a higher-income one built on services and consumer spending. The stakes are high — not just for China, but for the rest of the world. Economic growth is slowing in China in a way it hasn't in a long time. "I think you have to be honest and say there are big chunks of the economy that are in recession right now," says Arthur Kroeber, head of research at Gavekal Dragonomics, a Beijing-based economics research firm. That word – "recession" – is one you almost never hear in China. The impact on China's coalfields and rust belt is already painful, Kroeber says, and will only get worse. "That will create unemployment problems," he warns. "It will create bankruptcy problems. It will create nonperforming loan problems." China is shifting away, he says, from an economy built on things like investment in infrastructure and housing. "The big deal has been that China, for years, was just in this incredible housing boom," he says. "And every year, they were building more units than the year before. Basically, what happened was that people said, 'Oh, well, we're going to go up forever.' So people built too many steel plants and too many cement plants and too much of everything. And then it stopped growing." Faced with falling demand and too much capacity, coal mines have shut down in western China. In the country's northeastern rust belt, Kroeber says, "Instead of the steel plant closing down, they will cut back production. They'll put their workers on one- to two-day-a-week shifts." That is all part of a punishing – if inevitable — path to a new economy. Where some analysts in the West see calamity, Andy Rothman, a longtime China economist and investment analyst with Matthews Asia, sees progress. "People just don't seem to understand how much change has happened in the Chinese economy," he says. "So you can go to China's rust belt and say that manufacturing or construction-related industries are doing quite poorly, which they are. But you also have to pay attention to the consumer and services part of the economy, which are doing quite well – and the fact that income growth in China adjusted for inflation is still rising by 7 percent." Consumption is a bright spot in this economy — and you can see it in places like Shanghai's Super Brand Mall in the heart of the city's financial district. At lunchtime on a weekday, the 8-story mall is filled with people riding the escalator to the top-floor IMAX theater and lining up outside a restaurant that serves cuisine from the country's far northwest. But making the Chinese economy a lot more like Shanghai and a lot less like the country's rust belt won't be easy. For one thing, consumer spending isn't growing fast enough yet to replace the old economy. And economists say the government needs to give up monopolies in finance and telecom and create a freer environment for innovation to boost growth. "You know that innovation cannot be planned," says Xu Bin, a professor of economics and finance at Shanghai's China Europe International Business School. "Innovation has to be done by people. So you need to really allow people to think more freely, to have more intellectual property rights, and all these would require the government to abandon certain targeted, favored sectors." Is this fundamentally a tension over control? "I think so," says Xu. "I think so." The government next needs to begin laying off millions from state-owned industries, including moribund steel mills in the northeast, Kroeber says. Keeping them open keeps people employed, but otherwise they are drag on the economy. Kroeber is not certain that officials – who traditionally fear economic unrest – are prepared to that. But the costs of failing to do so could be dire. "We could wind up in a situation like essentially what Japan was in the '90s, where they never do it and China winds up growing at a very slow rate — and all these stories of China taking over the world go away," he says. If China's economy slows dramatically, that would be awful for much of the rest of the world, which has come to depend on China for so much of global growth. After a huge drop in the past couple of weeks, Shanghai stocks rose for the second day in a row. Now, for many, that's a relief, but China's economy has a long way to go. It's in the midst of wrenching transition, from an economy based on investment and manufacturing to a higher income one built on services and consumer spending. As NPR's Shanghai correspondent Frank Langfitt reports, the stakes are high - not just for China, but for the rest of the world. FRANK LANGFITT, BYLINE: Economic growth is slowing in China in a way it hasn't in a long time. ARTHUR KROEBER: I think you have to be honest and say, look, there are big, big chunks of the economy that are in recession right now. LANGFITT: This is Arthur Kroeber, head of research at Gavekal Dragonomics, a Beijing-based research firm. And he used a word you almost never hear in China - recession. He says the impact on China's coalfields and rustbelt are already painful and will get worse. KROEBER: That will create unemployment problems. It will create bankruptcy problems. It'll create non-performing loan problems. LANGFITT: Kroeber says China's shifting away from an economy built on things like investment in infrastructure and housing. KROEBER: The big deal has been that China, for years, was just in this incredible housing boom. Every year, they were building more units than the year before. Basically what happened was that people said, oh, well, we're going to keep going up (laughter) forever. So people built too many steel plants and too many cement plants and too much of everything. And then it stopped growing. KROEBER: ...Instead of the steel plant or whatever closing down, they'll put their workers on, like, one or two day a week shifts. LANGFITT: That's all part of a punishing, if inevitable, path to a new economy. Where some analysts in the West see calamity, though, Andy Rothman sees progress. Rothman's a longtime China economist and investment analyst with Matthews Asia. ANDY ROTHMAN: People just don't seem to understand how much change has happened in the Chinese economy. So you can go to China's rustbelt and say that manufacturing or construction-related industries are doing quite poorly - which they are - but you also have to pay attention to the consumer and services part of the economy, which is doing quite well, and the fact that income growth in China, adjusted for inflation, is still rising by 7 percent. LANGFITT: Andy Rothman's right, consumption is a bright spot in this economy. And, in fact, if you want to get a sense of it, you just come to a place like Super Brand Mall, where I am right now. It's in the heart of the financial district. It's eight stories high. And it's noon and the place is packed. I'm watching people going up and down the escalators all the way up to the top where the IMAX movie theater is. I've passed restaurants where there are lines outside. So even with all that's going wrong with China's economy and the market, people - at least in big cities like Shanghai - are still out spending. But making China's economy a lot more like Shanghai and a lot less like the country's rustbelt won't be easy. And for one thing, consumer spending isn't growing fast enough yet to replace the old economy, and analysts say the government needs to give up monopolies in finance and telecom and create a freer environment for innovation to boost growth. Xu Bin is a professor of economics and finance at the China Europe International Business School here in Shanghai. XU BIN: You know that innovation cannot be planned. Innovation has to be done by people. And so you need to really allow people to think more freely, to have more intellectual property rights. And all this would require the government to abandon certain targeted, you know, favored, you know, sectors. LANGFITT: Is this, fundamentally, attention over control? BIN: I think so, I think so. LANGFITT: Arthur Kroeber says the government next needs to begin laying off millions from state-owned industry in the northeast. He's not certain officials, who traditionally fear economic unrest, are prepared to do that, but the cost of failing to do so could be dire. KROEBER: We could wind up in a situation like, essentially, what Japan was in in the '90s, where they never do it, and China winds up growing at a very slow rate and all of these stories about China taking over the world go away. LANGFITT: If China's economy slows dramatically, that would be awful for much of the rest of the world, which has come to depend on China for so much of global growth. Frank Langfitt, NPR News, Shanghai. Transcript provided by NPR, Copyright NPR.